A few weeks ago this jumper on Ravelry prompted a few ideas to start kicking around in between my ears. This afternoon I treated myself to a spot of half-scale fun, after a boring few days of computer spreadsheets. The jumper, although a clever idea, is not a shape that will work for me. At my size, if I don't have sufficient body-reference in a garment, I risk looking like a crumpled pile of fabric sitting on the floor. I'm not sure when I'll get back to this and where it'll go, but today's little interlude was a welcome sanity-break from the computer. Hopefully, now the ideas have been explored a bit, my kicking and popping brain might be quiet for a while. 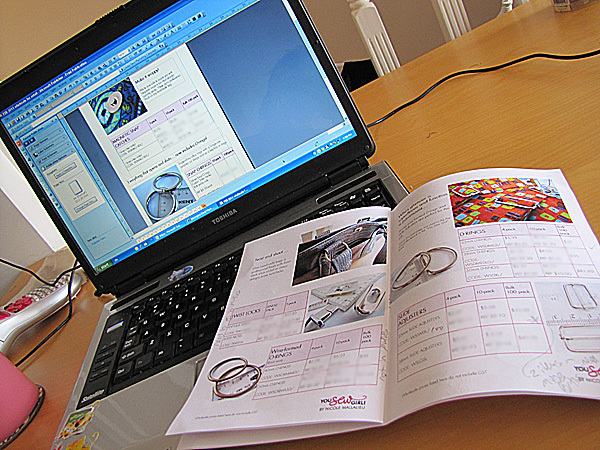 The good news is that I've finished the new wholesale product listings and brochure. That was the job I had to do before I allowed myself to play dress-ups with my half-scale dummy. ﻿And yes - twist-locks, plastic satchel fittings, brass o-rings, snap o-rings, magnetic catches, wire-formed d-rings and slide-adjusters are all now on the wholesale list. Start asking your favourite local or online stockist for them NOW! PS. ....and speaking of getting you to make me look popular... If you read this blog but don't officially "follow" it, please follow it. If you're on Facebook and like what I do, please like my business page (not my personal one - that doesn't count). If you live in the USA and want to see my book there, please check in here regularly, share the blog-love and Facebook-love with your friends etc.... We have to impress a few US publishing big-wigs here, and web statistics speak volumes. I now officially love you on your blog as well as facebook.. and I've just linked another one of your patterns. I hope you have finished with the computer for awhile now too Nikki! Ooh, I love the very notion of something as official sounding as Subtraction Cutting - and lovin' the look of that skirt. PS. IS THAT 'WORD' OPEN ON THAT LAPTOP?????? If, by "follow" you mean "subscribe" - well I do already. Or is that different? If so, please tell me what to do so I can "follow." I'd follow you anywhere ! Ooh, looking forward to seeing where your big thunk over the jumper goes. Alas, I already know it would look like a sack on me, ho hum! you know how much I love you! also now earwormed with Gilmore Girls theme. I don't do facebook. ever. and I don't follow people on that google thing. Never understood it. And our Twitter account is locked so I'm sure no-one is looking to see if I follow them there or not. I'm raising my hand as high as I can! Are you listening, US Publishers??? Please carry Nikki's book soon! I love your blog, have a look to see if there is a new one every day. Sorry I don't do Facebook or Twitter. Can you please give a list of the stockists that keep your items, have tried a couple of the online stockists, but, unfortunately they haven't got your fittings or interfacings. I'm sure it won't be too long before that piece of fabric becomes a thing of originality and awesomeness! Love your "play". Have liked your facebook page too. Love seeing behind the seen glimpses of your "playing". You are so creative, Nikki! Will look forward to seeing more on this design. PS. Can you see my hand up? I'm the one jumping up and down madly, hoping, wishing and wanting your book to make the jump to North America.